Pioneers in the industry, we offer wire rope pulley block, block hook and rope pulley block from India. We are one of the noteworthy enterprises engaged in offering superior quality Wire Rope Pulley Block. This rope is manufactured using quality 362 or 358 or 312 grade materials. The heavy duty materials offer strength and reliability to the rope pulley block when load or unloading task is applied. In addition, this rope pulley block is coated with galvanized finish to strength it support the high tension effortlessly. Clients can opt to get the rope pulley block manufactured and obtain length according to the business requirements. Our firm has been continuous gaining appreciation as the prime organization offering of Wire Rope Pulley Block. This block is manufactured using high grade iron alloy 312 that provide high stability strength and dependability to the rope. The given block has 1F thickness and 50 to 150 mm wheel gauge size. Our professionals manufacture the block using advanced machines and innovative technology that aid in developing the robust block used for different load, unload, pull and packaging applications. 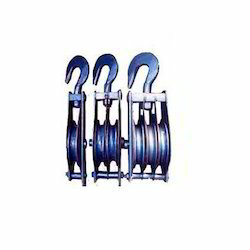 We are counted amongst the recognized organization offering of premium quality Block Hook. This hook is manufactured using optimum quality allow material belonging to the category of 314 and innovative technology. 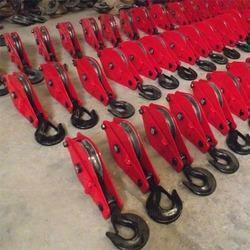 Our professionals are particular in making hook having different block sizes. The block sizes vary from 3F to 6F diameter that can support the torque in-between 1 ton to 10 ton effortlessly. Clients can also get the hook designed and developed according to the business needs. We are well known suppliers and manufacturers of prominent range of Rope Pulley Block. High quality raw materiel, latest high modern technology and machines are used in the manufacturing by talented and experienced professionals. Our blocks are sourced from reliable vendors in the market and are offered in different specifications to fulfill the diverse requirements of all our clients. 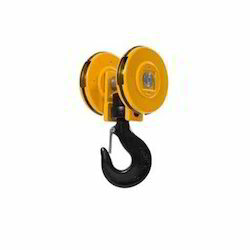 Chain (Pulley) Block is used to lift heavy loads from the dock, go downs as well as construction sites. These blocks are famous for its higher efficiency and smoothness in the operations while lifting loads. These blocks are appreciated highly by our industrial clients due to its unique performance.